I wasn't an avid fan of kanava (squid) neither was I introduced to this fish long back.But when I got to taste this fish ten years back , I liked it.It was different from the usual fish tastes. Kanava curry is one such recipe that I mostly make with squid(kanava). This was something later I got hold of after repeated trial and error. However,once this recipe tickled all the taste buds in the family the credits have changed from curry to this roast and should I say more, all just love it. Seriously I don't feel there is a need to explain the tastes as its very much evident to any spicy food lovers from the pics,right ? Go ahead and give this a try, am sure you will love it !! Clean the squid by firmly pulling out the head in a twisting motion clearing the inner cavity,the ink and bone like structure and peel the slippery skin.Cut into round pieces/square pieces.The tentacles are edible and can be cut out after the head portion and can be used.Wash under running water,drain water and keep aside.Marinate the squid with turmeric powder,pepper powder and salt for half an hour. Heat oil in a cooker and add the minced garlic,ginger.Saute until raw smell disappears.Add the sliced onion,shallots, green chillies and curry leaves.Saute until the onion turn slightly browned.Add in the spice powders on low flame and add in the tomatoes.Add a few drops of water and cook until the tomatoes turn mushy and gets blended with the onion mixture. Add the marinated squid and mix well.Add 1/4 cup water,adjust salt(the marinated squid has salt so add carefully). Cover the cooker with lid and pressure cook for 3 whistles on medium high flame. 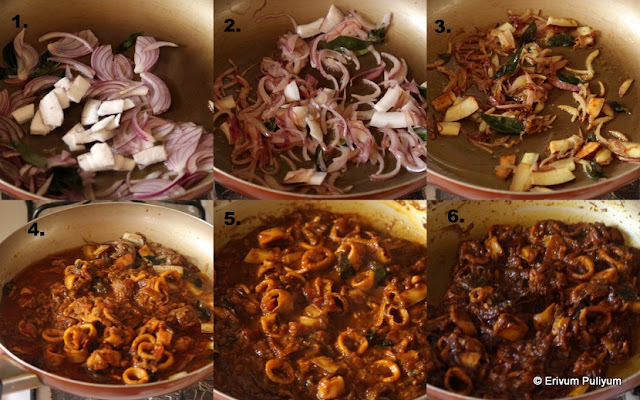 Wait until the pressure is released.Heat a tbsp of oil in a wide non stick pan.Add in the sliced onion and coconut sliced,curry leaves.Saute until the onion turns brown on frequent stirring.Add in the turmeric powder,garam masala,pepper powder on low flame.Add the cooked squid with masala. Let the moisture dry up in the masala by stirring continously for about 10 minutes on high flame(the time may vary as per the amount of left over water in the masala). 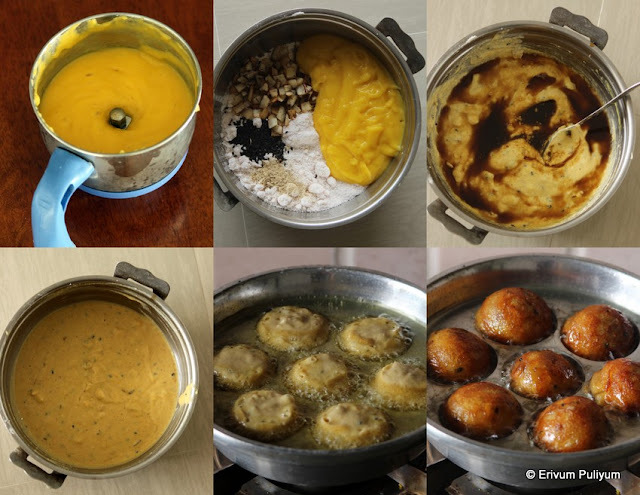 Serve warm with idiyappam / appam / kallappam(velayappam) /chapathis/rice. 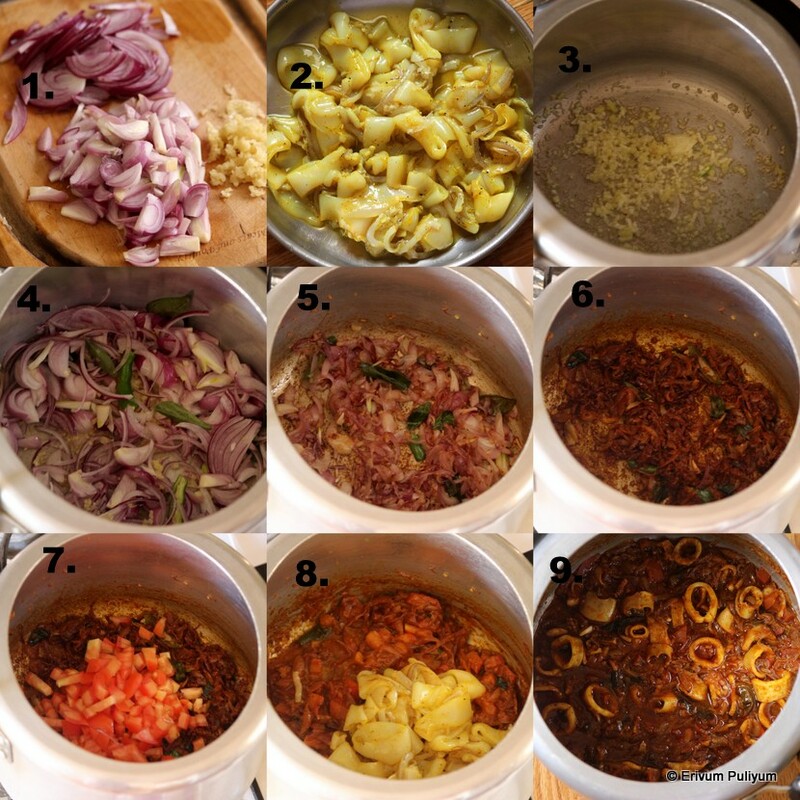 * Its better to fry the sliced coconuts and then add onions which imparts more flavor to the roast. * You can try this masala for making chicken or mutton roast. Its been more than a week since I posted something here.Sorry for the wait,guys. I was quite busy at home so couldn't spare some time here. Though there are many posts in drafts but due to time constraints I was away. Anyways,hope you all are doing good. Eid is just a few days from now and many of you are busy with everyday Iftar preparations,I know. 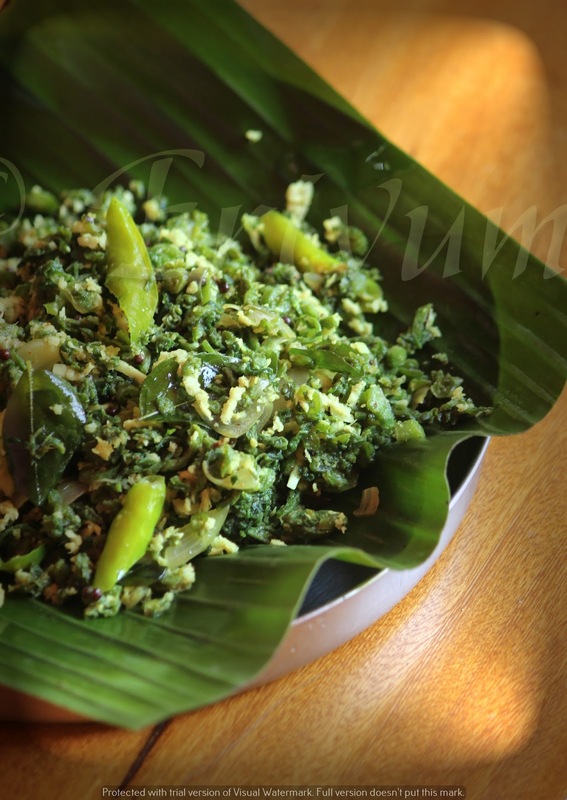 Today's post is a simple snack made from plantains popular in Malabar. 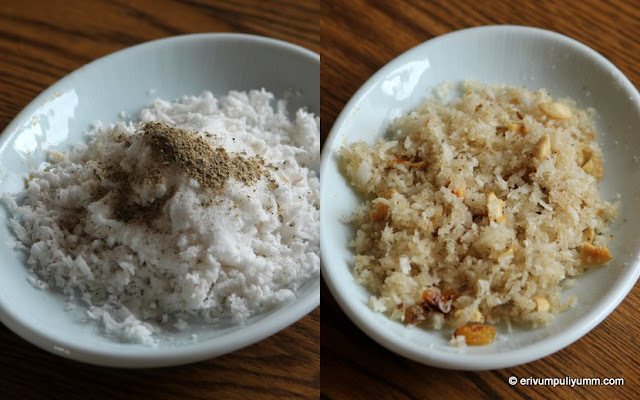 This snack is very simple to make but tastes delicious with the coconut flavors and crunchy bites of nuts and raisins. I make this as a after school snack for kids which they totally enjoy. Please don't forget to click the right side corner of the page for more yummy Ramadan recipes. Do try and let me know the feedback if you haven't tried yet !! Heat ghee,fry raisins and cashews.Add grated coconut,cardamom powder and sugar.Stir well. Saute till the moisture is dried. In a bowl, add the ingredients listed to make the cover.Mix well,add salt and make a thick batter like dosa. Keep aside. Peel the plantains and make a slit just like the way in pic,keep that piece of plantain aside. Remove the seeds and keep aside. Fill the filling in the slit and cover with the cut out piece or leave the slit out and cover just with the maida batter. Next,dip the filled plantains carefully in the batter or just cover the open spaces in the cut out plantains so as to seal the filling and to make sure it doesn't seep out.I have dipped the whole plantains in batter but its totally your choice about how to seal the cover. Heat a pan and add oil.When the oil becomes hot,slide in the plantains and fry till golden brown on all sides.I have used very less oil and have turned frequently to get that proper crispy effect. 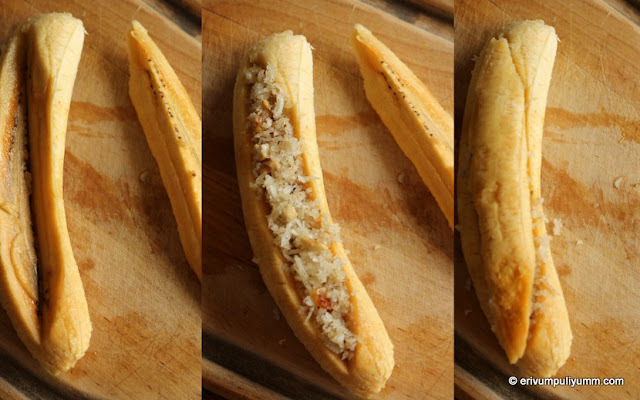 Repeat the same step with remaining plantains. Serve warm with tea !! * You can add the cardamom with sugar and powder it. * Use ripe plantains for preparing this snack.Though semi ripe plantains are preferred, but its tastes better with ripe plantains.